Earlier this year, I decided I really wanted to get a Polaroid camera. Just by looking at it online, I fell in love with it’s simplicity. There weren’t a ton of settings (next to none, really) and it forced the photographer to photograph things as they were – with no manipulation. A little less than a week ago, Aaron & I were on a date when we came across one for a steal of a deal, and we bought it. I’ve taken 3 pictures so far, and I’m in love! I ordered more film too so I’ll have more chances to take pictures. So far, this picture (see below) is my favorite. First of all, I took it blind (which basically means I was just holding it out in front of me with no idea how it would turn out), & I think it’s beautifully simplistic. 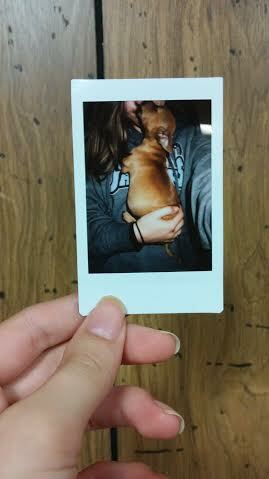 That’s what I love about Polaroids. It’s a style in and of itself. It’s nothing you can create, it’s its own. Anyway, on this “Beating the Mondaze” I hope to encourage you to find beauty in the simple things. Whether that be a picture or the way the road bends on your way home from work today. Whatever it is, find it. Share it. & love it.